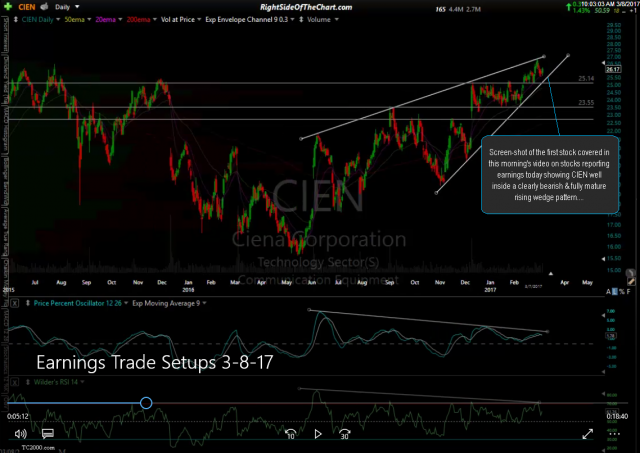 The video covers the outlook for numerous stocks with clearly bullish or bearish chart patterns that are scheduled to report earnings today. Also discussed are several factors & strategies that traders might consider when trading a stock around its quarterly earnings report. One example of the point that was made in the video that it has been my experience that more often than not, an earnings-induced gap and/or the next direction in the stock in the coming days/weeks+ can be predicted with a fair degree of accuracy if the technicals on the stock leading up to the earnings report are clearly bullish or bearish. Emphasis on the word ‘clearly’ as holding a position into earnings on anything but a clearly bearish or bullish chart pattern that appears ready to break-out at that time is nothing short of a crap shoot, particularly on stocks with a history of large earnings induced gaps. 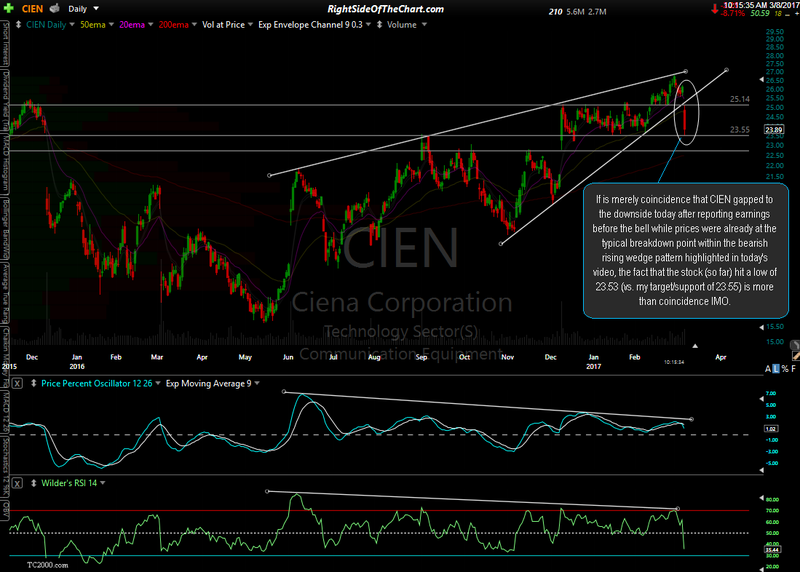 Case in point: The first chart above is a screen-shot of the first stock covered in this morning’s video on stocks reporting earnings today showing CIEN (Ciena Corp) well inside a clearly bearish & fully mature rising wedge pattern that appeared ready to pop any day now. If it is merely coincidence that CIEN gapped to the downside today after reporting earnings before the bell while prices were already at the typical breakdown point within the bearish rising wedge pattern highlighted in today’s video, the fact that the stock (so far) hit a low of 23.53 (vs. my target/support of 23.55) before reversing is much more than coincidence IMO. The fact the stock gapped to the downside, below both the bottom of the wedge & that 25.14 support level, followed by very swift waterfall sell-off which literally stopped within 2 cents of where a reaction was expected is simply a clear example of how technical analysis can help not only predict future price directions but also where those moves are likely to stop/reverse.